The Face Of God is a spiritual mystery thriller that will keep you on the edge of your seat. Pastor Daniel Lawson is on a church pilgrimage with his wife Jill, when she is brutally murdered. Her last words will continue to haunt Daniel and set him on the course he finds before him. Before her death, Jill is given a stone with ancient inscriptions upon it and was told her husband would one day hear the voice of God. Daniel, along with his estranged son, Tyler, follow the trail that will lead them to a prophecy in which one day, all the stones of the 12 tribes of Israel will be reunited and change the destiny of the world. However, Daniel isn't the only one searching for the stones, members of the Islamic movement under a jihad are also searching for them. They have a plan to destroy over 200 million inhabitants of the earth in order to cleanse it of the infidels. Daniel doesn't know who his friends and his foes are as he is removed from his element and placed into unknown lands and customs. Dr. Helen Zimmerman, is a Middle Eastern archaeologist, an expert in her field, who is commissioned by the MOSSAD to befriend Daniel and his son and stop them from accomplishing their goals, but as she comes to know them, will she be able to continue her mission? Nayra Fazil is the daughter of one of the elite Islamic leaders and she has been honoured to serve for Allah in helping the religious cause, by becoming acquainted with Tyler and his dad. However, as she becomes more immersed in her duty, she finds her faith questioned and she is torn between what she knows is right and what she has been taught. As the parties involved move closer to their fates, will Daniel gather the stones before the world ends or will he become a warrior of God and set things right? I really liked this story, it has enough violence to make it real and the bumbling antics of Helen were hilarious. I found all the characters to be believable and I highly enjoyed their interaction in the story. I enjoyed the pace and flow of the story, even though there were a couple of issues with time lines, the story was still great to read. I loved the history aspect of the stones and wished the author had given just a bit more information concerning each of the tribes of Israel. I thought how each of the characters came to grips with their own personal spiritual journey was well written and the grace in which God's touches each of their lives most thought provoking. I would recommend this book to anyone who enjoys a good religious historical mystery. THE TERRORIST has learned of supernatural stones used by the Old Testament High Priests to hear the audible voice of God. As the mastermind of a deadly plot that will soon kill millions, he has had a series of dreams instructing him to find the stones. Everything else is in place. The wrath of God is poised and ready to be unleashed. All that is stopping him is . . . THE PASTOR. His wife has been murdered and his faith is crumbling before his very eyes. With his estranged son, he also searches for the stones in hopes they will rekindle his dying faith and love. With the lives of millions hanging in the balance, these two men of opposing faiths collide in an unforgettable showdown. 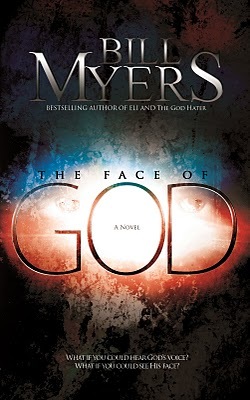 “The Face of God” is another thrilling and thought-provoking novel by a master of the heart and suspense, C.S. Lewis Honor Award winner, Bill Myers. Thanks for stopping by and entering my Giveaway! Following you now!